Call in any time during shop hours to browse and try on evening dresses but please make an appointment to try on wedding dresses and discuss designs. Evenings are available, by appointment only. PARKING: Meters are nearby in Ann Street and around The Steyne. There is a multi-storey car park next door. 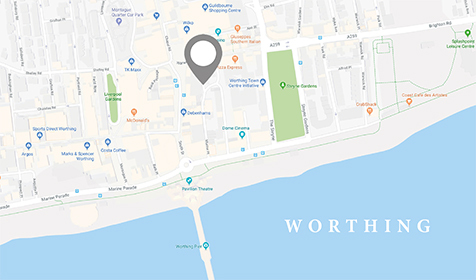 Sat Navs will send you to the wrong end of the High Street, we are close to Steyne Gardens, near the seafront, in Worthing Town Centre. To hire an evening/prom dress, we ask you to pay a minimum, non-refundable deposit of £40, the balance doesn’t need to be paid until you come for the fitting, the week you are wearing it. To buy a new dress we have in the shop, the sooner you pay for it the sooner you get it! If we are ordering one in your chosen style and colour, we will need half the price; again you can pay in stages, but remember, if it’s not in stock, it can take up to three months to be made and delivered. Some arrive in a few days. For designs we are making for you, any amount can be put down as a deposit, but we won’t start making your dress until about a third has been paid. We are quite flexible, and there is no extra credit charge. Don’t worry. We know you will do your best to look after it, but we also want you to enjoy wearing it! Unlike other companies,insurance, repairs and cleaning are included in the hire price. We can take all our dresses in, so it’s not a problem. If you have gone up in size, you may need to choose another style, but quite a lot of our designs have a laced back, so there’s some flexibility. Bespoke designs have the last fitting close to the wedding/occasion, so again it will be a perfect fit. There are no extra alteration charges for dresses made individually to order from a design appointment as the price is set from the start, so you know the total cost. Evening dresses being hired or bought from stock may need a few alterations, especially darts and hems, for which there is a small charge between £10 to £30, depending on how much needs doing. A good fit makes all the difference, and we are happy to alter any of our own dresses, but not others, sorry. You don’t need an appointment to look at or try on evening dresses but if you are considering having one made, you do need to book ahead.